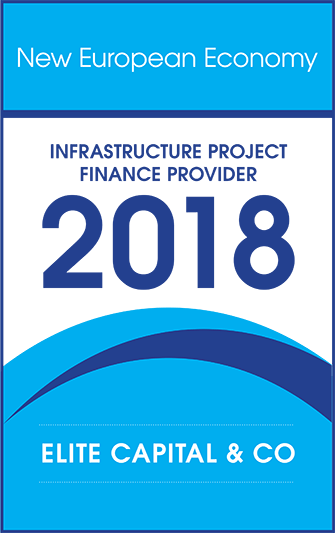 The prestigious “New European Economy” magazine has awarded Elite Capital & Co. Ltd the title of “Infrastructure Project Finance Provider 2018”, as a result of Elite Capital’s continued efforts in designing bespoke finance solutions in challenging market conditions. London, UK (AGENCIES) February 20, 2018 — The Information Department at Elite Capital & Co. Limited (ECC), announced today that the company features in the specialized and prestigious New European Economy Magazine in its January 2018 issue in Britain and the European Union countries as the “Infrastructure Project Finance Provider 2018”. The award is the result of focused efforts and synergy between the ECC Board of Directors and our employees and strategic partners all over the world over the past years. It also reflects the ability of the Company’s strategy to adapt to the prevailing global economic circumstances and testifies to the viability of the planning process adopted by the Board of Directors. Elite Capital & Co. Limited is a private limited company that provides project related services including Management, Consultancy and Funding, particularly for large infrastructure and commercial projects. ECC services are suitable for all types of Infrastructure Projects in either Greenfield (Pre Operations Stage) or Brownfield (Operations Stage) including but not limited to Sea Ports, Airports, Railway, Bridges, Roads and Highways, Water and Sanitation Utilities, Energy, Communications, Hospitals, Schools and Social Infrastructure etc. This includes other projects or activities that impact positively on the relevant country’s basic infrastructure including the manufacturing of components used in infrastructure (such as cement and steel) and infrastructure associated with mining and agribusiness. This entry was tagged Award, Finance, Financial, Infrastructure. Bookmark the permalink.